This is a very delicious and versatile cereal. The Triple Play serving suggestions at the bottom take this into many different directions, fun for kids of all ages! Adding dried blueberries, cranberries or strawberries turns this into a SUPER FOOD cereal with three top SUPERFOODS - oatmeal, berries and walnuts! 2. Spread oats and walnuts on a baking sheet that has a low rim, or use a roasting pan. Bake 8-10 minutes, stirring after 5 minutes, until the walnuts and oats smell toasted and start to brown. 3. While oats and walnuts are toasting, combine brown sugar, oil, honey and cinnamon in a large bowl. 4. Ask a grown-up to help with this step: Pour hot oats and walnuts from the pan into the sugar mixture. Add coconut. Stir all the ingredients together until evenly coated with the sugar. Mixture will look dry. 5. Line the baking pan with a piece of aluminum foil so it extends over the ends of the pan. Spray foil with cooking spray. Spread oat-walnut mixture onto foil. Bake 5 minutes. Remove from oven and stir. Bake additional 5 minutes until toasted and golden brown. Remove from oven and stir again. Cool completely on pan. Break crunch into chunks. Lift edges of foil and pour crunch into an airtight container or plastic bag. Measure the honey in the spoon you used for the oil – the honey will slip right off the spoon! Put fresh or frozen berries in a small bowl and top with Triple Play Walnut Crunch. Microwave 1 minute or just until warm. Serve with vanilla yogurt or ice cream. 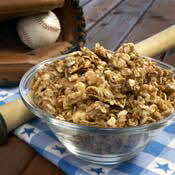 Add fresh or dried fruit to a bowlful of AllStar Walnut Crunch. Top with yogurt or milk. Combine Triple Play Walnut Crunch with raisins, cranberries and dried apricots (or favorite dried fruits) and pack in a bag for a take-along energy snack.